Getting their name from the shotgun barrel shape, shotgun mics pick up sounds in front of them, while eliminating any background noise. They use unidirectional diaphragms to achieve a high concentration beam, slightly differing from lavalier microphones that pick up sound from only a small area. They're ideal for meetings, lectures, conference talks, and speeches. Shotgun camera microphones serve a similar role as studio broadcast microphones in sports reporting, documenting, recording, and voiceovers. Falling into a high-directional microphone category, shotgun stereo microphones are more directional than supercardioid or typical cardioid mics. The microphone rejects unwanted sounds from all sides, picking up only the desired sounds in front of it (on-axis). Shotgun mics have several openings on the receiver that allow sound to enter the interference tube. The interference tube then differentiates between off- and on-axis sounds. On-axis sounds pass to the audio circuit for amplification, while the off-axis background sounds will take longer paths and become out of phase. Close sounds from the rear will enter the mic's tube in reverse order, and will phase out by the time they reach the diaphragm, resulting in no output. Regardless of your budget or the microphone's intended use, you can get a shotgun that works for you. If you want XLR shotgun mics that capture sound from a distance, choose one with a high sensitivity rating. Keep in mind that if you're using a stereo mini-jack input on your camcorder, you'll need an XLR adapter to use the mics. Self-noise refers to noise introduced to the audio path by a microphone's circuitry. High self-noise in a microphone could lead to an audible hiss when capturing quiet sounds. Therefore, consider high self-noise mics for loud sounds, and low self-noise mics for low-pitch sounds. 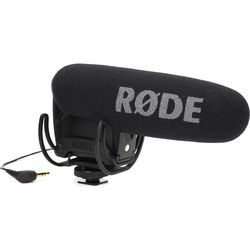 Boom mic kits used for film are good examples of low self-noise mics. The length of your mic's interference tube is also an important factor. A long tube gets rid of the most off-axis sound, giving you crisp, clear sound. For best results, it’s recommended not to move around when using it. It’s a suitable option for booming and voice pickup. Consider a medium shotgun mic for less demanding audio recordings. It comes with a more affordable price tag, and has a good off-axis frequency rejection. Unlike handheld interview microphones, a shotgun mic will give you the convenience of talking hands-free, and capture your voice accurately. No matter the type of shotgun microphone you want, B&H Photo and Video has a wide range of options to consider.